This new generation digital video recorder will astound you with just how slim it is. Thanks to its ultra advanced technology it is able to keep a sleek, slim form while still retaining professional quality recording capabilities. Due to its slim size and low weight, this item is ideal for those who demand high quality on the go recording such as law enforcement professionals or private investigators. Plus, because it is so thin and light weight you can easily slide it into a cigarette box for even more covert recording! With its internal Li-Ion battery you'll be able to run this model for up to 4 hours with its motion activation feature! The product is a breeze to use both to take your footage, and to upload and view it. 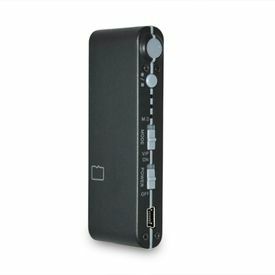 Thanks to its native AVI recording format, you can easily connect the device to your PC via the included USB cable and upload and view your footage in seconds. You can even upload the footage directly to YouTube with no need to convert formats!